In the last three decades, under the administration of the “Südtiroler Burgeninstitut”, it was possible to do several restoration- and conservation procedures. 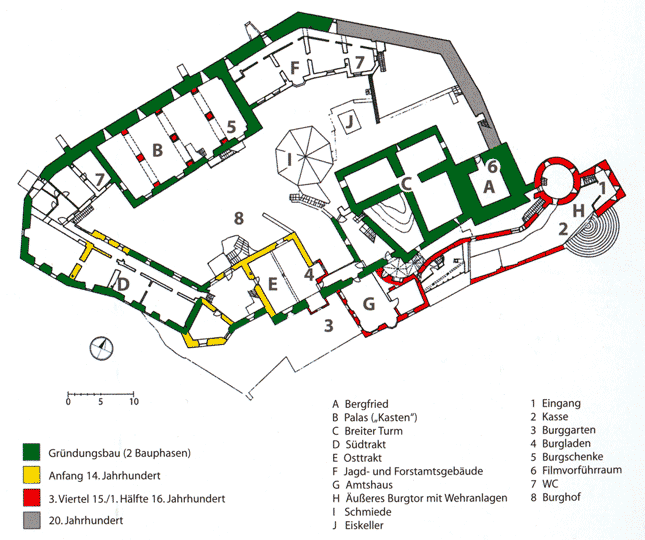 Now even more areas of the castle are accessible to the visitors. As early as 1136 a noble-free family is named Taufers. 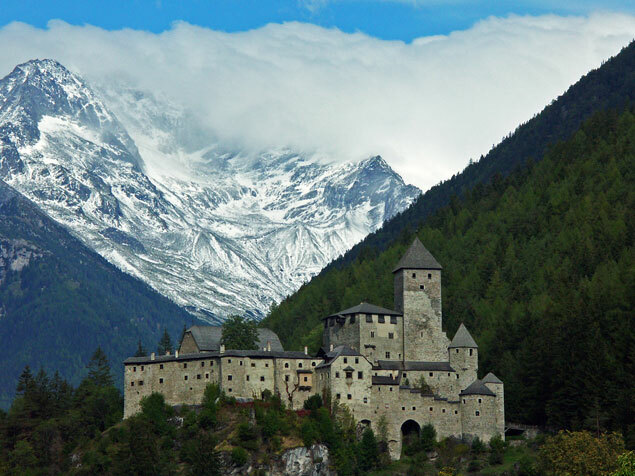 In the 1220’s the family built a new, generously arranged lord house, whose donjon with an attached living tower is constructed against the mountainside, as this was thought to be the possible attacking side. The powerful Taufers Castle (Burg Taufers) is a dynastic seat of the Barons of Taufers with impressive and interesting fortified grounds. Another great hall (later used as grain storage room) is located at a secured area in the western part of the castle. The naturally given construction space is delimited by a surrounding curtain wall, where there are different living complexes, attached to it. In the 15th and 16th centuries the grounds were renovated into an expansive castle residence, most of them built in the early 16th century. The impressive weir system, although, dates back to the 15th century. 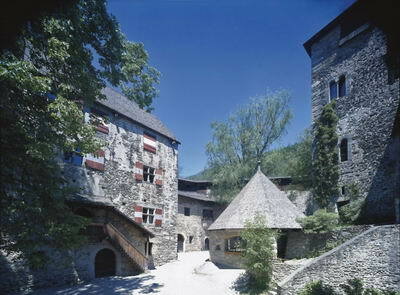 Burg Taufers has been in the possession of the Südtiroler Burgeninstitut since 1977. 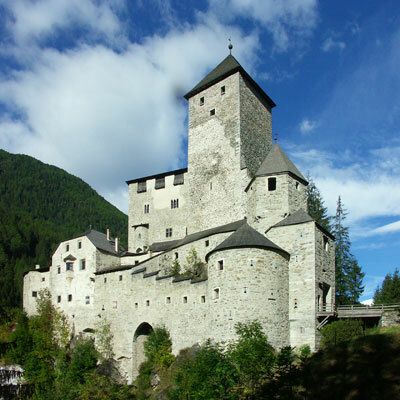 The entire furnished and well preserved castle numbers among the greatest and most beautiful castles of the entire Tyrolean region. 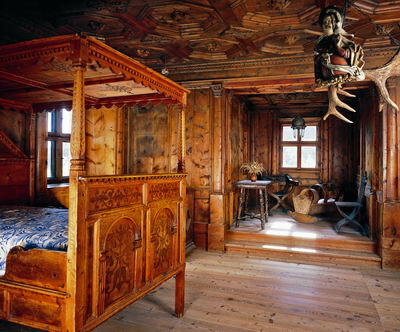 Of the sixty-four rooms of the castle, around two dozen are paneled. 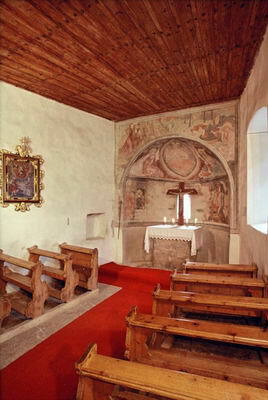 In the castle chapel, there are frescoes of extraordinary value from the school of Pacher. Particularly noteworthy is the Prince's Room, the large library, the courtroom, the so called Haunted Room, the dungeon, the armoury, and the many tiled ovens.